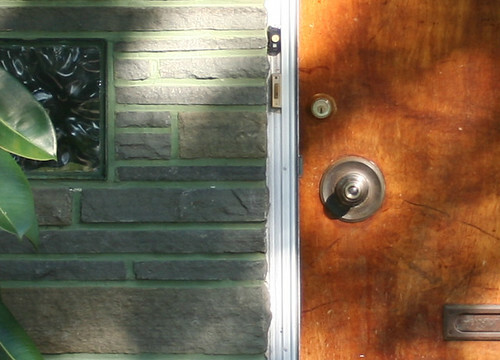 The two open-backed designs below are both from Schlage, dating back to 1956: the Manhattan and the Continental, respectively. 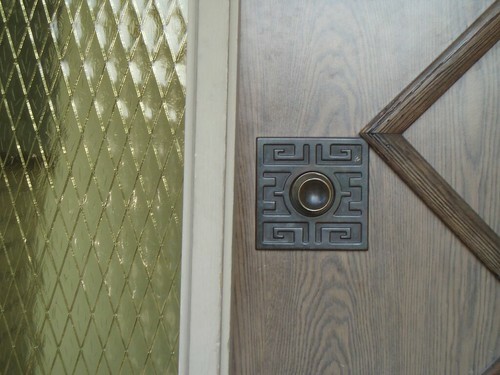 Schlage, by contrast, went for the starburst designs, including the two below. 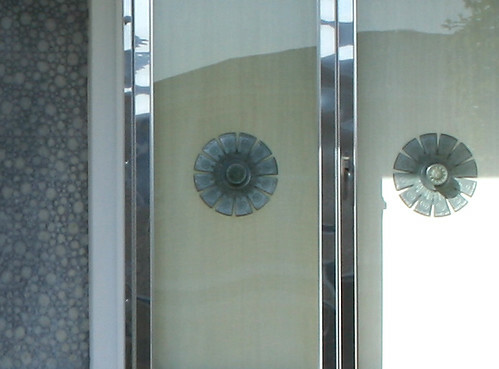 Heavy round designs were also common, simple but massive plates with textured patterns. And then I’ve encountered a few that are seemingly unique, elegant patterns of unknown inspiration and as-yet undetermined manufacturer. Finding these bits of hardware takes a bit of diligence, a lot of peering into the shadows and past the trees and bushes and screen doors. They don’t pop out like a spectacular building does. It’s rare that a good photograph can be taken from the public right-of-way (once or twice I’ve indulged in a little benign trespassing to get the shot! ), so getting a good capture is all the more rewarding. 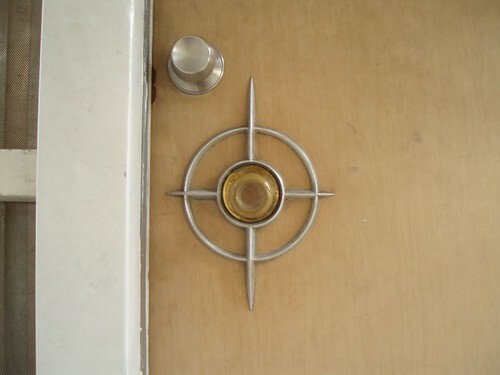 I would love to have any of this door handles. I am guessing my trip to the local Home Depot will turn up empty. 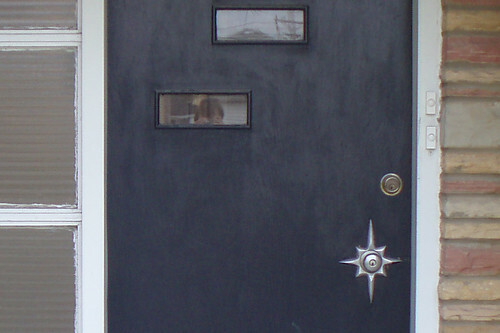 I grew up next to a red brick and white limestone “infill” building (next to our “heraldric medieval” red brick and limestone six-flat) which had a brass starburst door escutcheon. 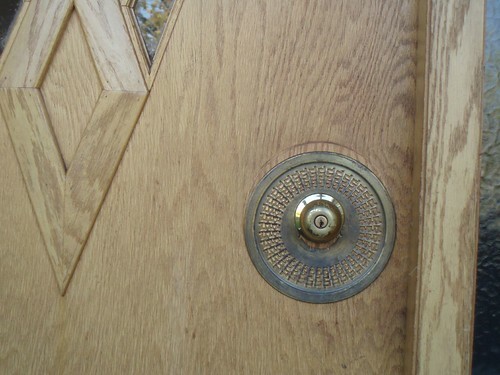 When we lived in the country before we were reverse white-flight my best friend lived in a ranchy house with a center knob (as in being in the middle of the door) with a crazy escutcheon. The house also had sunken tubs with fish faucets and a Monte Carlo AND Orange Civic in the garage (this was the mid-70s). Very cool pics. I’m going to pass this along to my wife. 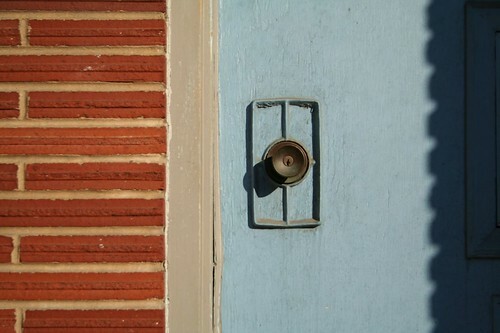 She’s a designer with a huge affinity for mid-century modern elements. She’ll love it.Thanks for posting! 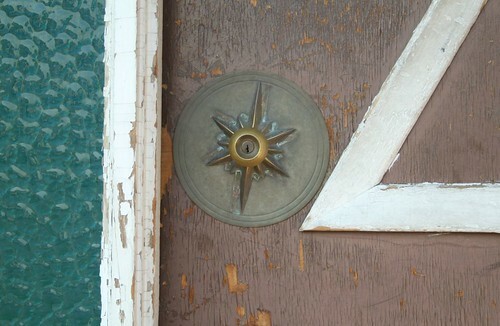 Great pictures, they do say that God is in the details! 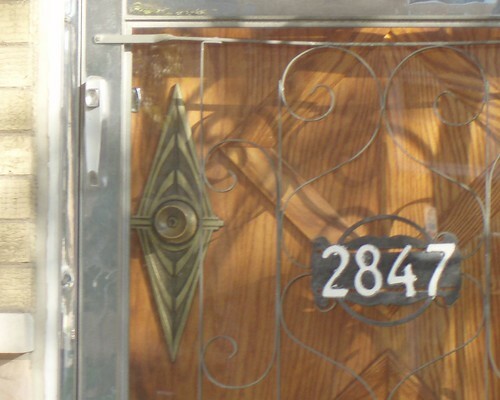 Smitty's locksmith offers keyless locks and name brands like Schlage and Medeco.